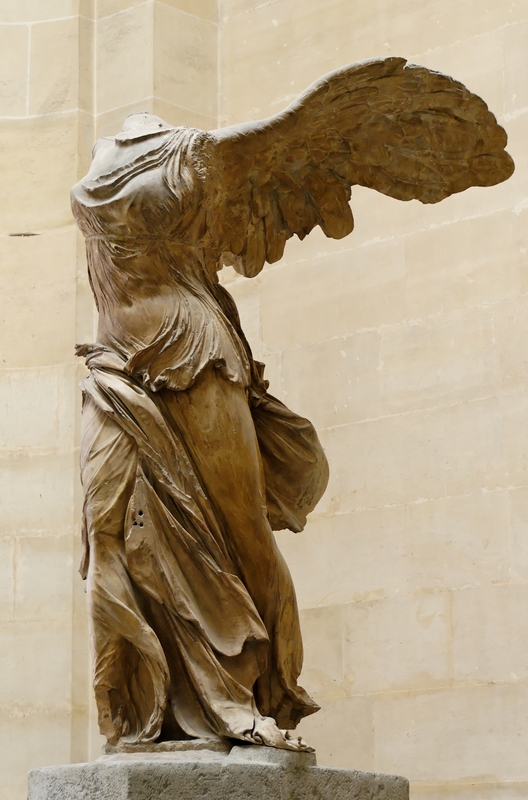 Nike of Samothrace, the Winged Victory, was my favorite sculpture in my early adulthood, when I thought I could make a living as an artist. While in the Navy, I had the opportunity to visit Paris with a couple of shipmates. We fit in a visit to the Louvre for about half an hour. My buddies ran off to find Mona Lisa, but not I. I found the Winged Victory. Somewhere I have my own picture of it (probably a 35mm slide, probably lost to Davy Jones locker). Here is a picture from Wikipedia, in the public domain. Notice the lack of a head. Even without a head, victory can be won! 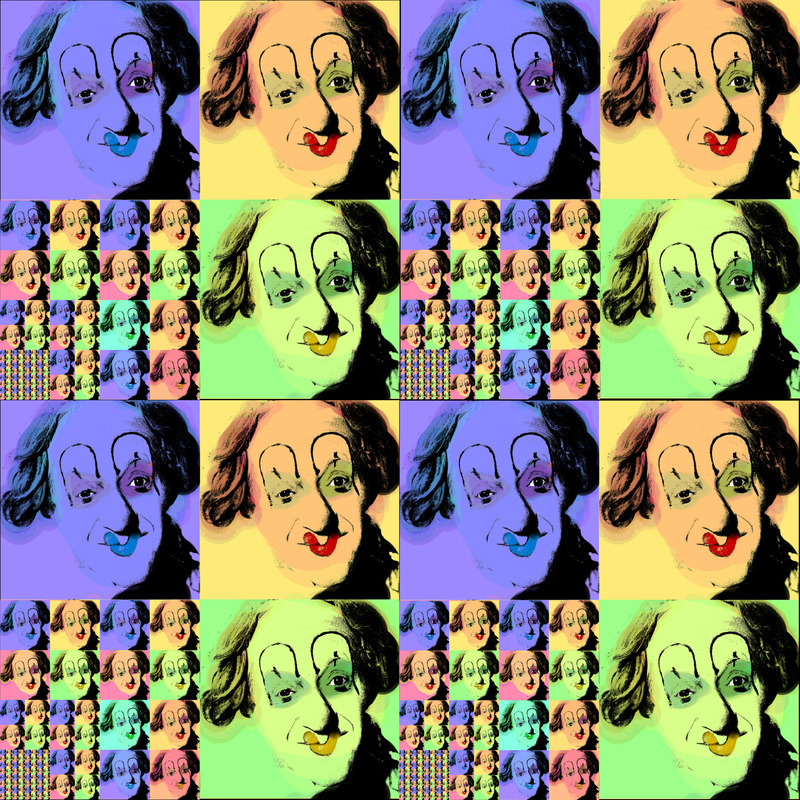 Even if you haven’t done Art for ages (or for The Ages) you can make Art for ds106! Welcome one and all! Have fun, Make Art, learn, apply, share, help, sit back and watch, fit it in with all you do, make it all you do. It is up to you! You have earned a badge! You have qualified for this badge by your willingness and desire to participate in the headless ds106 digital storytelling class. You may download and use this badge for your own purposes. In addition to this page, it is downloadable from flickr at http://farm8.staticflickr.com/7379/9577294403_6fa892cc14_o_d.gif. Creative Commons attribution, non-commercial licensing applies. My sources were John Johnston for the flaming headless ds106 person, and http://www.says-it.com for the original badge design. Today’s Daily Create is “Power corrupts, take a picture of something powerful”. However, the first thing I noticed is that there was a warning located where there would be thumbnails of the submitted images: “Awesome Flickr Gallery Error – User not found”. This particular error wording is reminescent of Flickr’s actual messages, with an informal, sarcastic, humorous approach. Awesome error? I don’t think so, Vern. But, I am not absolutely sure if it is an error with Flickr, or an error in the scripting of the Daily Create and its method of scraping the images from Flickr. I can imagine Alan Levine (who does so much work in programming these things) putting in the error as a humorous comment himself. I doubt it, though. I think he really wants the ds106 site to work seamlessly and error-free. For the image, I took a screenshot (ctrl-prtsc on my Toshiba Satellite), opened a new file in GIMP, pasted in the screenshot, and used the rectangular selection tool to select the section I wanted. Then I inverted the selection and deleted to get rid of the rest. However, I made mistakes in sizing the image, so I gave up (temporarily) on GIMP and pasted the selection into Paint, from which I coulc crop and save. Then I opened up the saved selection into GIMP as a layer, and duplicated the layer so I could have two of them. On one of the layers, I selected and deleted the error message. Then, using the color picker I picked the dark gray (grey?) background, and then filled the empty selection with the paintcan fill tool. This gave me a layer with the error message and one without. Finally, I exported the image as a gif, setting the animation time for 500ms (half-second). Of course, to view the animation (blinking the error message on and off) you have to view the gif correctly. Generally, opening the image in a browser will work. But WordPress requires that I insert the media at its full size. My first try may have been too big at over 500 pixels wide. I rescaled it to 350 pixels wide, and it works. I have the image on Flickr also, were it has be viewed in its original size to see the animation. I am not yet using Tumblr, but my original (on Flickr) image might not work there, since it is larger than 500 pixels wide. Thanks to the many folks participating with ds106 for informing me in many ways how to make animated gifs and other media experiments. Skip Daily Create? Not today! Today’s Daily Create (tdc588) asks us to “Create a pass or certificate that allows you to not complete this Daily Create.” At first I thought this quite paradoxical: if I created such a pass, I wouldn’t have to create such a pass; but if I didn’t create such a pass, I would have to create such a pass. 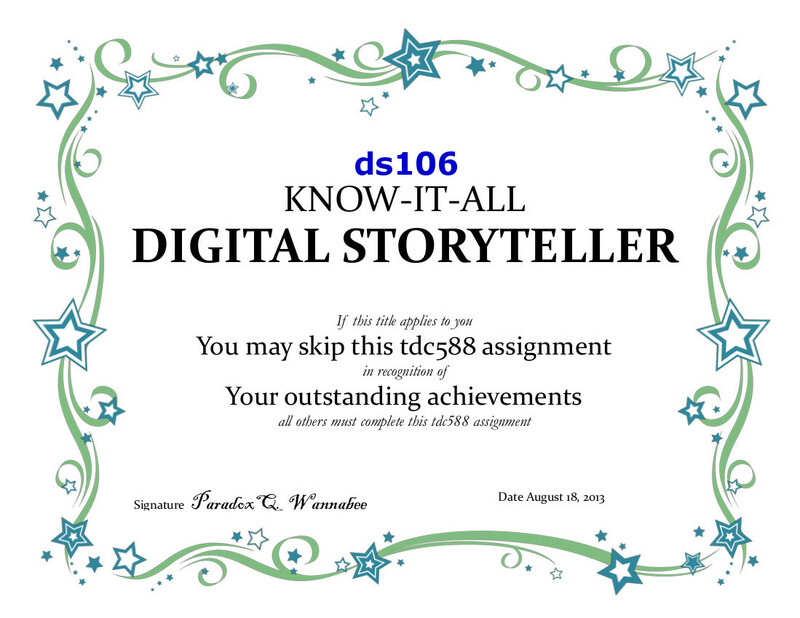 However, in researching suitable certificates, I realized that there was a way out of the paradox: if I claimed I already knew everything about digital storytelling, I wouldn’t have to create a pass. Since I don’t know everything, I have to create a pass to allow those who know-it-all to skip out. So, if you are a know-it-all, you can skip this one (if you copy my certificate). But, if you don’t claim to know-it-all (most of us) you need to complete this task. To make my certificate, I used Microsoft Word and found a suitable certificate template. After changing the wording to suit my purpose, I saved the document as a pdf. This allowed me to import it into GIMP to then export it as a jpg. If I wanted to spend a little more effort on this, I would change the background to parchment, but I won’t in case you want to print this yourself. 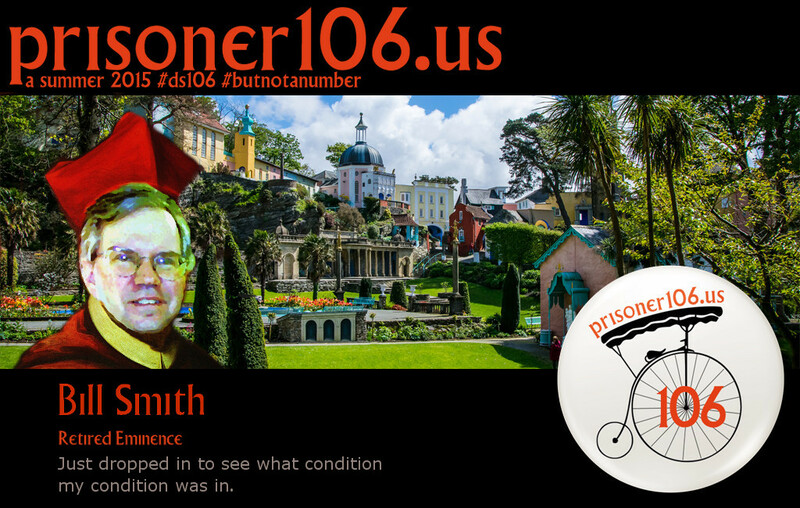 Very simple, really, but I did learn a couple of tricks with Word and GIMP, so I am getting very slightly closer to the know-it-all satori that ds106 illuminati exist in. 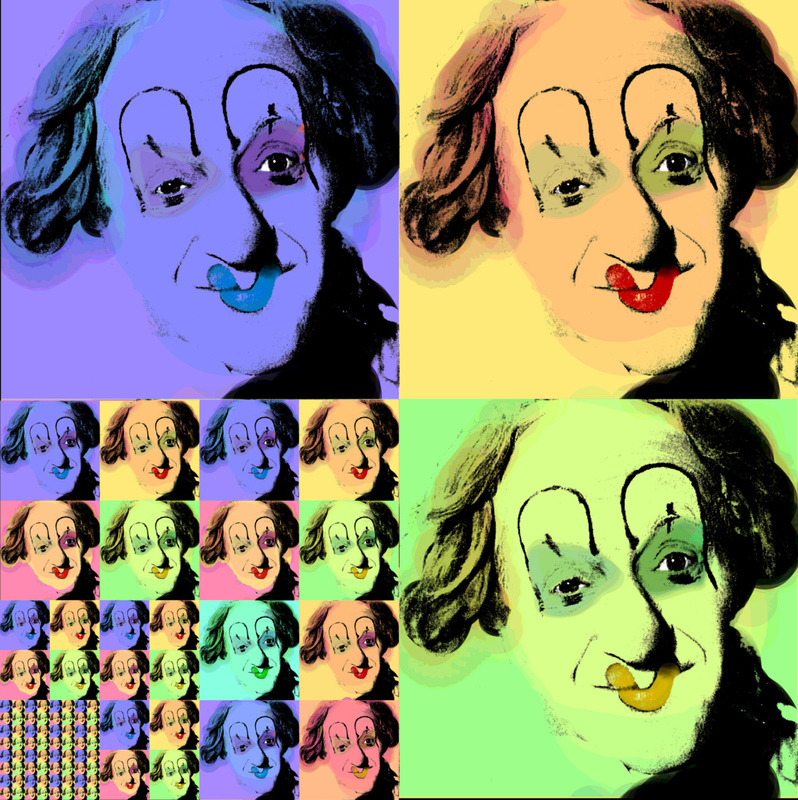 A few days ago, our ds106 friend Stefanie posted a nice warholized image of Coco the clown. I am impressed with her work, not only for the coloring but for the regressive tiling down into the lower left corner. It has its roots in math, not quite Fibonacci, not quite what Escher would do, not quite what Penrose would do, but something that Stephanie did. I have taken her idea a little futher. 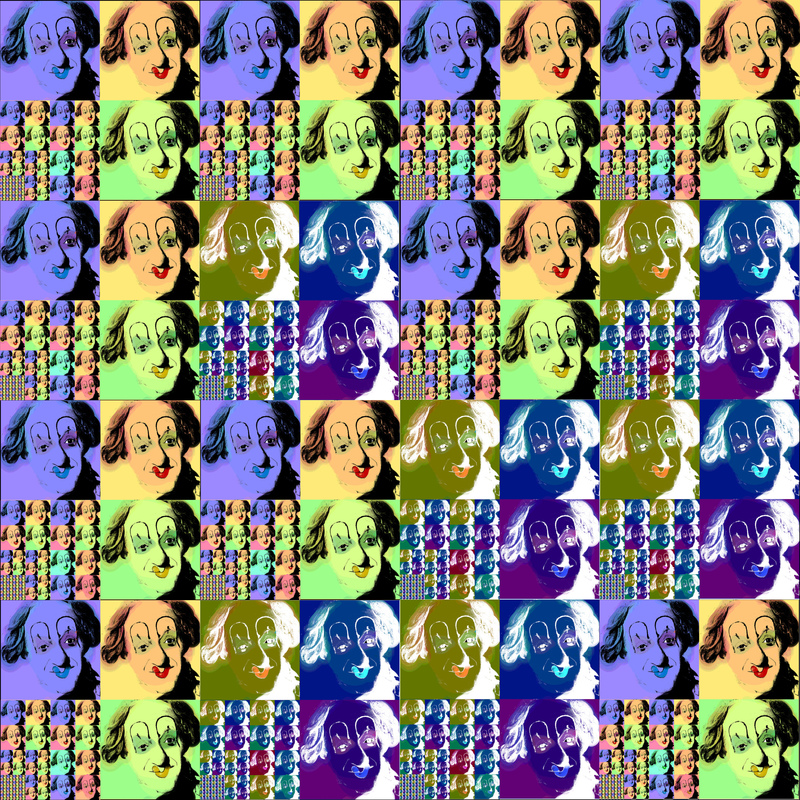 Recognizing that the pattern she created could be used to fill a plane (like wallpaper that needs to line up at the seams), I duplicated her image four times and placed the new tiles into a square twice as large along the horizontal and vertical dimensions. Though I didn’t do it, this would work with other aspect ratios, such as making the overall pattern eight or sixteen times longer than tall. Finally, just for the fun of it, I played around with inverting the colors in some squares. I thought of the Hadamard transform (used, among other things, to create the Walsh codes used in CDMA cellular systems), where the lower right corner is always inverted from the basic pattern. This could be increased as large as you want, doubling the dimensions each transform. What are you smoking in that pipe? Another in a never-ending series of not-a-pipe images. This one has sunflowers from gif-favicon.com (free use, from a public domain original) emitting from Magritte’s pipe. Or so it seems. I wish I had a picture of my first car, a 1964 Chevy Corvair, white with daisy stickers on the side. I peeled off the stickers and paint came with them, so I replaced them with footprint stickers, walking up the door and over the roof. The assignment for tdc576 is “Make a 360deg panoramic photo of a room in your house.” I did not use an app, and found out late in the process that my Motorola Photon Android phone has a panoramic mode for the camera. I set up my Nikon D3200 dSLR on a tripod in my home office and just took several (11) pictures, rotating the camera after each, and leaving the focus and exposure on automatic. Each image is about 1.6 MB. After loading them onto the computer, I used GIMP to open the images as layers. I scaled the layers down to a more useful size (300 pixels tall instead of 3000). Then I changed the canvas size to have enough room for the eleven images (451 pixels x 11 = 4961 pixels). Then I simply moved each layer over to its correct spot in sequence, merging down onto the previous (accumulated) layer each time. In the end, there was some space left over (so I didn’t need to be so exact in the canvas size, but it helped to guide my placement), so I fit the canvas size to the layer size. The individual images did not line up perfectly, so there is an irregular white space along the top and bottom of the final image. But, for an essentially cut ‘n’ paste job as one might do with paper and scissors, I think it turned out ok. The final step was to export it as a jpg. The final size was only 455 kB. You will need to zoom in to see much detail.